The Sun Temple at Abu Simbel is a popular tourist attraction which has featured in well-known films like Death on the Nile and The Mummy Returns but had it been left where Ramses II built it 33 centuries ago, it would now be under water. 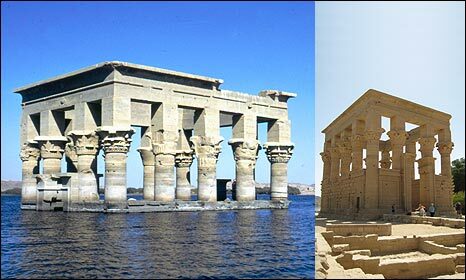 Fifty years ago this year Egypt and Sudan asked for international help to save ancient sites threatened by the construction of the Aswan High Dam. "It was going to submerge all the area of Nubia - monuments, people, the landscape, everything," says Costanza de Simone from the United Nations' culture agency, Unesco. "So the two governments launched an appeal to Unesco. "The work brought people from all over the world into Nubia, people with different backgrounds: archaeologists, engineers and geologists. They had to invent new methods and techniques. "It changed the vision of how to preserve cultural heritage." Over two decades the race to carry out large-scale excavations uncovered thousands of artefacts and huge monuments were carefully cut into blocks and dismantled before being rebuilt in new locations. The most famous are the temples of Abu Simbel and Philae. "The Nubia campaign was very important," says the head of the Egyptian supreme Council of Antiquities, Zahi Hawass. "It was the first time you saw such international cooperation. 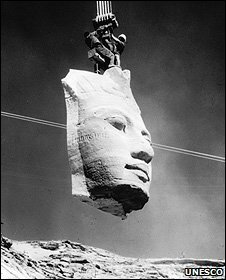 "Egypt sent the message that our monuments don't just belong to Egypt - they belong to everyone - and that is why so many different countries participated." Experts who worked on the salvage projects are celebrating the anniversary of the campaign with events at the Nubia Museum in Aswan this week. It was built after they finished work to display their finds and explain the distinct history of the Nubian people. Tens of thousands of Nubians were moved from their ancestral homeland along the Nile - in southern Egypt and northern Sudan - because of the dam. Many were resettled in the desert where they were unable to practise agriculture and young people left in search of work. Uprooted, they began to lose Nubian languages and customs. "The Nubia Museum was a gift for those who sacrificed their homeland," says the director, Osama Abdul Waruth, who is Nubian himself. "Nubian culture is one of the oldest and richest in Africa and dates back before Egyptian civilisation although this later overtook it. "The original environment of the Nubian is to be on the shore of the Nile. It is the source of life itself - but also our myths and traditions. 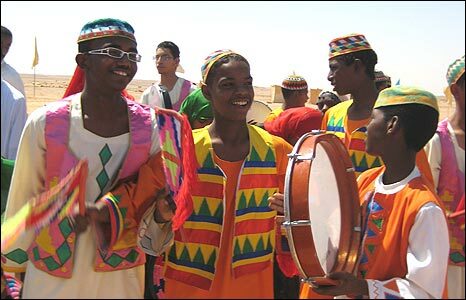 "In the desert, Nubians are kept away from all their intangible heritage connected to the Nile. The living culture will disappear soon if they do not go back home." Nubians have long been fighting to return to land by Lake Nasser, close to their original villages. It is widely believed that economic and security concerns have kept them away. However there have been recent signs the authorities' attitudes could be changing. The governor of Aswan has announced plans to build almost 5,000 new Nubian homes at a site chosen by community elders. Abdallah Muhammad Abdul Fattah was a child when his family left its village in 1964. "I still remember it with sorrow with a broken heart - you can imagine what is your feeling when you are prevented from going to your native land," he says. "When I dream, I never dream in my village now. All my dreams are in our old Nubian one." At a gathering to lay the cornerstone for the new development, Mr Abdul Fattah smiled broadly as Nubian children sang of the beauty of Aswan. "All the Nubians are very happy because they are about to return to their motherland."